Mondo Cine - ZineWiki - the history and culture of zines, independent media and the small press. 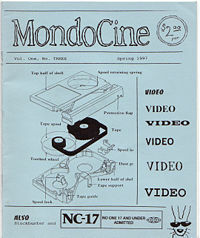 Mondo Cine was a 4-issue film-industry-related zine published by Roger Leatherwood from California, U.S.A., during the period of 1997 - 1999. Four issues appeared, covering topics such as the off-market at Cannes, exploitation films, upcoming (at the time) digital sound technology in film theatres, the the changes in the ratings system from X to NC-17 and how it affected releases at Blockbuster video. Leatherwood was a long-time movie theatre employee and also worked as a manager at Blockbuster Video during the ratings change, which affected such titles as "Tie Me Up, Tie Me Down" and "Henry and June", both of which were pulled from Blockbuster shelves. Issues were typed and xeroxed on 8 1/2 by 14 and folded in half, with different colored cardstock for each issue (#1 pink, #2 blue, #3 yellow, #4 green) and sold for $2.00. Distribution was through the mail and after #2 through Tower Records. Approximately 75 copies of each issue were distributed, and after 4 issues the author deduced that he had cleared approximately $10 in profit over the course of the entire run. Leatherwood now writes a blog closely related in tone and content, called "Mondo Cine". This page was last modified on 3 July 2010, at 05:21. This page has been accessed 3,763 times.